Scan of cutting kindly supplied by Mark Crowson. Submitted by Royce on 18-Jan-17 4:35pm. It's probable that several older people spotted the big price hike between that quoted in the pic above and the actual Quasar retail price - that I believe was nearer £6K. No doubt people with better memory ansd enthusiasm for details can be more specific. I don't know the details behind the Quasar retail price but a similar inflation occured to the Voyager retail price that came out at £9250, a bit enbarrassing as I'd quoted 'around £6000' only eighteen months earlier on that Top Gear shoot. I can throw some light on that inflation however. We achieved a build cost per bike of £6,500, based on the actual costs of producing five bikes, not too far out of line and somewhat due to the discovery that ex-F.1 innovators appear to work faster than the average production worker, for less money.. Series production would have seen this price reduce. Biggest contributor to the price hike however was the charge of £1000 per bike for public liability insurance, due to the novel design and naturally ignoring the moderate power, performance and emphasis on safety. One imagines this could have been negotiated down after a few hundred Voyagers had been sold. SCL also added a bit less then £1000 for profit, which I thought was possibly excessive, but they were doing it to make money. The rest of the hike was 'car tax' levied on all new vehicles that time, a payment to the state for the priveledge of making vehicles. Other interesting costs were a mere £600 for each brand new Reliant engine, complete with our specified cam and all ready to go. However the Guzzi transmission 'kit', flywheel to rear wheel, with brake and starter cost £1200, the most expensive single purchase. Submitted by paulblez on 21-Jan-17 12:53am. 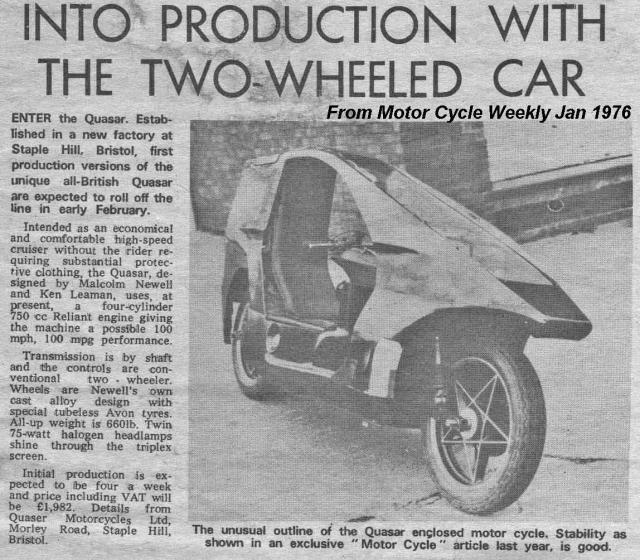 Mark Crowson reminds us that in fact, in their Bristol factory, "Wilsons produced 7 Quasars in 3 years, starting at £3,500 and climbing steadily in price weighing in at over 700lbs." He also points out that on this Quasar, as shown, (and unlike all the others) "There is only one front disc and no wing mirrors!" Finally, "The early headlamps were from a Vauxhall, (VX490? ), but I should think that they used after-market bulbs. I was under the impression that it was illegal to fit anything over 60w for road use, though the Quasar certainly needs all the help it can get in that respect!" Most of the remaining Reliant-engined Quasars were built in Calne, at Romarsh, principally by John Malfoy, who also designed the fluorescent rear light.